Chennai Super Kings (CSK) are all set to play Kolkata Knight Riders (KKR) in the match no 23 of VIVO Indian Premier League (IPL), 2019. The action will take place at MA Chidambaram Stadium which is the Chennai team's home ground. 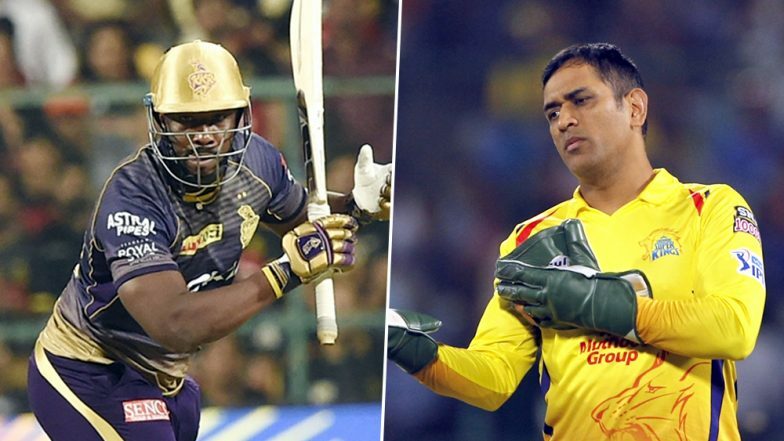 Ahead of CSK vs KKR, Chennai shares video of their skipper MS Dhoni saying that Andre Russell sixes gives him a nightmare. IPL 2019 Video Diaries: CSK All-Rounder Dwayne Bravo Becomes Hair Stylist for His Teammate Monu Singh Ahead of Their Clash With KKR in the Indian Premier League. Both CSK and KKR are heading the point table currently with eight points, where the latter is little ahead in terms of net run rate. Kolkata team is becoming more destructive match after match, as they are on a roll. KKR all-rounder Andre Russell has guided his team to victory in most of the matches they played till now in IPL Season 12. His unbelievable knock of 48 (13) against Royal Challengers Bangalore (RCB) will go down in the history of IPL as one of the best innings so far. KKR needed 76 runs to win from their last four overs against RCB, no one would have fancied KKR chances. But Dre Russell proved the cricket fans around the world that nothing is impossible. Chennai Super Kings vs Kolkata Knight Riders Live Cricket Score 23th T20 Match. MS Dhoni must have indeed worked out a strategy with his bowlers to face Andre Russell in the upcoming game against KKR. The Men in Yellow won their last game against Punjab, while KKR defeated Rajasthan Royals in their previous encounter.